Cree announced that its XLamp CXA chip-on-board arrays now offer options that double the lumens per light-emitting surface area, enabling directional applications requiring high center-beam candlepower. The company refers to these arrays, which aim for lots of candelas per dollar, as "high-density." Other products in Cree's lines of emitters, as well as products from much of the rest of the industry, are focused on achieving high lumens per dollar. First, the details. The CXA2590, CXA1850, and CXA1310 chip-on-board (COB) arrays have light-emitting surfaces (LES) of 19 mm, 12 mm, and 6 mm, respectively. The CXA2590 can be driven to produce 15,500 lm at high CCT. The CXA1850 goes to 9,000 lm, and the CXA1310 goes to 2,000 lm. Cree says that the CXA2590, with its 19-mm LES, enables luminaires with the same center-beam candlepower (CBCP) and quality of light as a 150-watt CMH light source while using less power, lasting longer, and facilitating better control. The CXA1850 can substitute for a 70-watt CMH while using half the power. And the 6-mm CXA1310 LED array can deliver twice the CBCP of a metal halide source at 30% less power, enabling the design of smaller, more efficient track lights. The LED arrays are available in CCTs from 2,700K to 6,500K. Across that range, 80 CRI is offered, with the addition of 95 CRI at the warm end and 70 CRI at the top. LEDs Magazine works through several comparisons of prototype light engines built on the new high-density arrays as compared to legacy sources. 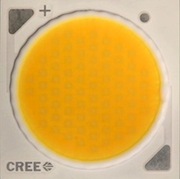 Cree assembled an engine based on the 6-mm CXA1310 that puts 31,000 cd in the center of a 9° beam. A Cree spokesman gave LEDs Magazine a rundown of BOM cost (about $34) that suggests the value of the high-density array in this highly directional application. The spokesman said the very best PAR20 ceramic metal halide lamps achieve a CBCP only near 20,000 cd. Soraa also had a high-density announcement, though it doesn't use that term in its press release. The company is touting an AR111 lamp, based on its GaN-on-GaN LED technology, that will generate 27,500 cd at the center of an 8° beam of light at 95 CRI and 95 R9. The punch is not quite as high as Cree manages from its new COB arrays, but the quality of light may be better. (I didn't see an R9 value for Cree's offerings.) The Soraa AR111 lamp also works in fully enclosed fixtures, which I believe is not true of Cree's XLamp LEDs. If it were not for Cree's earlier announcement, Soraa's might have received more attention for the CBCP breakthrough it represents.